A feel-good soft-top cruiser or a satisfying performance car? The S-range of Audis is synonymous with hard-core performance. But can hard-core performance combine with a soft top? Unfortunately not. 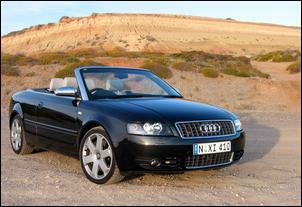 The S4 Cabriolet tries but ultimately falls short of delivering white-knuckled exhilaration. Think of this as a classy boulevard cruiser with the added thrust and aural attraction of a V8. Fire the S4's 4.2-litre V8 into life and there’s a deep-throated burble from the twin tailpipes - it’s a rousing sound that convinces you this is no ordinary car. And then you put your foot down. In normal urban-type driving, the S4's 6-speed Tiptronic transmission is lazy to kick down and, with limited low-end torque, you’re left wondering where the performance is. But drive the trans in manual mode (using the sequential branch of the gear selector or the steering wheel buttons) and you can use the appropriate ratio to get the V8 spinning in its happiest rev range. If you’re prepared to change gears manually you can appreciate the S4 Cab for its middle-to-high rpm performance and sweet singing top-end. The S4's 4.2-litre V8 employs DOHC, five-valve-cylinder heads with variable inlet cam timing, a dual-stage intake manifold, 11:1 compression ratio and Motronic management with electronic throttle control. 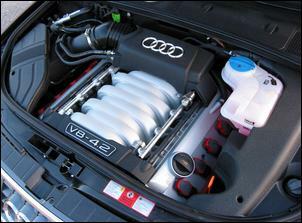 With the S4's low-restriction exhaust, there’s a maximum of 253kW (at a high 7000 rpm) and 410Nm of torque (at 3500 rpm). These are impressive numbers for a 4.2 litre engine - but that doesn’t mean this is a quick car. When all the hoo-ha comes to an end, the S4 Cabriolet struggles to accelerate from zero to 100 km/h in 7.1 seconds (measured with two people onboard). Sure, it’s swift but it pales against any local V8 - and even a good six will give it a close run. Interestingly, Audi literature quotes zero to 100 km/h performance in just 6.2 seconds; we can’t imagine coming close. The problem is weight. At 1895kg, the Audi S4 Cabriolet is very, very heavy. This weight also impacts fuel consumption - we recorded a disappointing 16.5 litres per 100km during our test. Oh, and you’ll need to reach deeper into your pocket to pay for the 98 RON fuel that’s required for maximum performance. Given the engine’s thirst, the S4 Cab’s 66-litre fuel tank is also quite small. 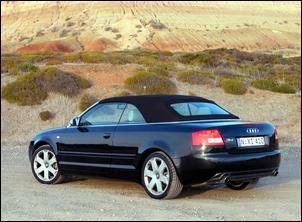 Like other high-end Audi models, the S4 Cabriolet employs quattro all-wheel-drive with a Torsen centre coupling. This system, combined with meaty 235/40 18 Continental tyres, gives the S4 Cabriolet impressive grip and stability. But only to a point. Push it too fast into a corner and the electronic stability program (ESP) lets the front run very wide. Lifting off the throttle does little to balance the handling in these situations. The S4’s Servotronic steering offers good linearity but lacks the feel you’d expect in a performance vehicle. This isn’t a car with a lot of driver feedback. But there can be no criticism of the brakes; with its big 340mm front and 300mm rear discs, the latest ABS, EBD and brake assist systems, the Audi stops powerfully time and time again. The S4 Cabriolet’s uprated suspension gives a firm, sporty ride - but it’s not harsh. Inevitably, some scuttle shake can be felt while driving on B-grade roads - as indicated by a vibrating centre mirror and chatter through the steering column. Chassis rigidity is noticeably improved when the roof is up but, still, there was enough flex to cause an occasional creak in our test car. When you hand over well over AUD$100,000 for the S4 Cabriolet it is hard to swallow the lack of a folding steel roof - all you get is a triple-layer fabric roof with a heated rear window. Fortunately, the Audi’s electro-hydraulic roof system is easy to use - just hold down a switch for the 30 seconds it takes to retract or deploy the roof. There’s a warning light that illuminates when the roof mechanism is operating but it’d be nice if there was a beep to confirm when the process is completed. Interior comfort and quality is outstanding. 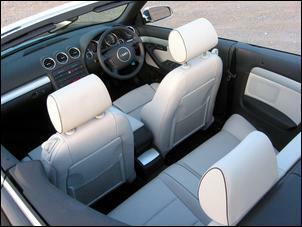 Audi’s Nappa leather front seats are the best in the business - supportive and superbly comfortable over long distances. The interior of the S4 Cab doesn’t offer a lot of sprawling room but there is adequate space for front and rear passengers. Boot volume is decent and you’ll find a full-size spare wheel mounted beneath the floor. A rear proximity beeper is a welcome feature (especially given the poor rear quarter visibility when the roof is up) and the courtesy lighting and switchgear illumination is outstanding. Safety features include four airbags, reinforced A pillars and automatically deployed rear roll-over bars. 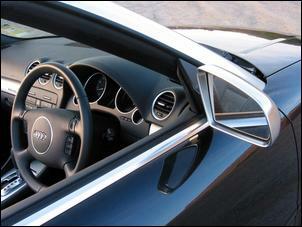 The standard Audi Symphony head unit and Bose speakers offer a tremendous amount of power and bass. Unfortunately, the ultra-deep exhaust rumble can cause you to adjust the bass and/or volume settings when idling at a set of lights with the roof down - the low-frequency barrage is just a bit overpowering. 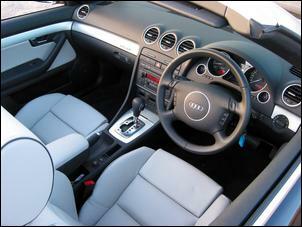 The S4 Cabriolet has an understated appearance but it is handsome with the roof up or down. The S4 is distinguished over cheaper A4 Cabriolets by its large front air inlets, titanium finish Xenon headlights, aluminium finish exterior mirrors and S4 badges. Cast aluminium 18 inch wheels and twin exhaust outlets complete the picture. The exterior and interior finish of our test car was top quality. And what about price, you ask? Well, at AUD$143,800 this is an expensive machine - too expensive, we think, to justify its 60 grand premium over the entry-level A4 Cabriolet. Sure, the S4 version offers a lot more performance than the 1.8T but not enough to deliver a killer punch. Forget the hard-core image. The soft-top S4 really is one of the softest performers in the S-range.